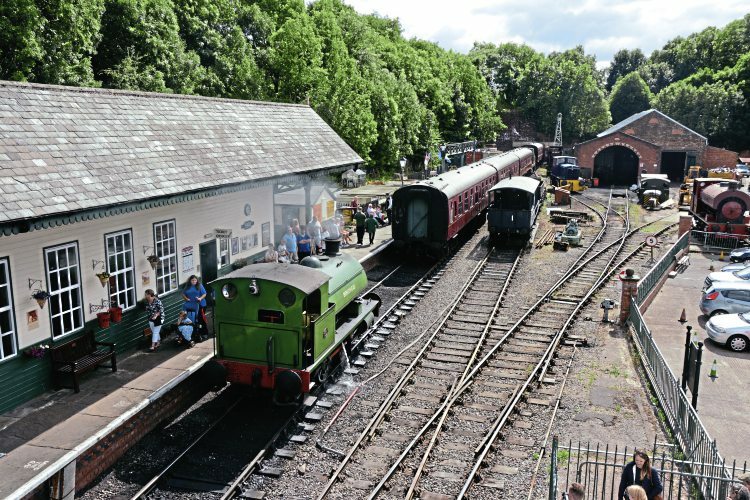 The Elsecar Heritage Railway is one of Britain’s smaller standard gauge heritage lines, but as Mark Smithers reports, the only preserved railway in South Yorkshire potentially has an exciting future ahead of it. The history of the line goes back to the year 1850 when a single-track mineral branch was opened from Elsecar Junction, near Wath, on the Doncaster to Barnsley section of the South Yorkshire Railway (later part of the Great Central), to Elsecar via Cortonwood. The raison d’etre of the branch was to serve several collieries and ironworks owned by the Rockingham family, headed by Earl Fitzwilliam, who had his own private station at Elsecar (not to be confused with Elsecar & Hoyland station on the Penistone to Sheffield route, which survives today as part of the main network). The terminus was latterly known as Elsecar goods station, but with the post-Second World War rundown of Britain’s coal industry and the growth of road freight transport, the importance of the branch steadily declined. Birkenhead passes over ‘distillery crossing’ immediately before arriving at the station at Elsecar, on footplate experience duties. Inset: Birkenhead’s maker’s plate. Eventually, only Cortonwood colliery was served, with the Cortonwood to Elsecar portion falling out of use, and when Cortonwood was closed during the miners’ strike of 1984/85, the remaining section to Elsecar Junction was closed and lifted. The story of the former Elsecar mineral branch might have ended in the 1980s, but for one reason: the Elsecar end of the line features many of the buildings that constituted the Earl’s workshops (later becoming the workshops of the NCB Barnsley Area) and the decision was taken by Barnsley Council to develop the area as a tourist attraction, known as the Elsecar Heritage Centre. As part of this attraction, it was decided to relay a section of the branch in the vicinity and create a new passenger station, complete with platform, canopy and footbridge, which was initially known as Rockingham station. The first public passenger service over the relaid portion of line, hauled by Avonside B4 0-6-0ST Earl Fitzwilliam (1917 of 1923), departed from the station on April 5, 1996. Nearly 10 years later, responsibility for the running of the railway passed from the council by way of a 50-year lease to the Elsecar Railway Preservation Group, which was rebranded under a charitable trust as the Elsecar Heritage Railway during the following year, 2007. At present the line in use extends from the terminus at Elsecar over a run of about one mile to Hemingfield (Tingle Bridge Lane), but the present state of affairs is very much ‘work in progress’ as a further mile is in the process of being laid to the projected eventual destination of Cortonwood. Much of the current running line passes alongside important aspects of the area’s industrial heritage and this is a major asset for both present operations and future ambitions. Sentinel 0-4-0VBTG No. 9376 of 1947 is currently a source of spare parts for other locomotives at Elsecar. The cylinders and crankshaft have been removed and the gap at the leading end, where they once stood, is clearly visible. The boiler is located within the cab, while the water tank is contained within the portion of the bonnet still visible in this view. At Elsecar, it is possible to see the new colliery surface buildings, which include the engine house containing a 1795 vintage Newcomen pumping engine that remained in use (after certain modifications, including a new 48-inch cylinder in 1801) until 1923, along with a basin and terminus associated with the Dearne and Dove Canal. The locomotive Earl Fitzwilliam has already been referred to and this engine was originally supplied by its Bristol-based manufacturer as Pitsford to Pitsford ironstone quarries, in Northamptonshire, as a representative of the mature phase of Avonside industrial locomotive design. This is denoted by the flat-sided, full-length saddle tank, which gives the ‘14 inch’ outside cylinder locomotive the appearance of being larger than it is in reality. Otherwise there is little that is remarkable about the design, save to note that close examination of its cab profile suggests certain affinities with Avonside’s Bristol neighbour, Peckett & Sons. Pitsford worked in the ironstone industry until the late 1960s, being initially preserved at the Fawley Hill Railway before being transferred to the Nene Valley Railway in 1972. After a further two decades, Pitsford was acquired by Barnsley Council as part of its heritage project and once again put into working order with its present name, Earl Fitzwilliam. The engine played an indispensable role during the early years of passenger operation, but sadly it had to be laid up in 2001when further repair work became necessary. 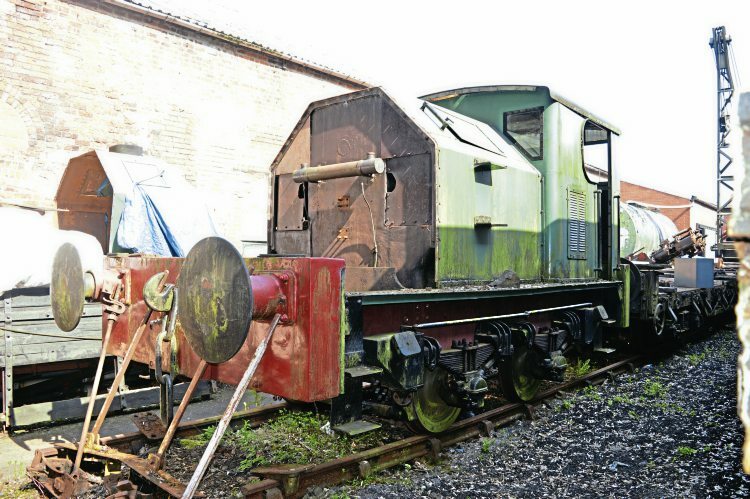 Earl Fitzwilliam is currently on display on a short stretch of track in the yard at Elsecar until the time and resources can be found to carry out the requisite work to restore it once again to working condition. The Bristol school of industrial locomotive design is further represented on the EHR by the line’s piece de resistance in the form of the ‘Mardy Monster’. This 1954-built Peckett locomotive No. 2150 is the sole survivor of the makers’ ‘OQ’ class 0-6-0ST with 18in x 26in cylinders, 4ft 1½in wheels and a boiler pressure of 200psi. 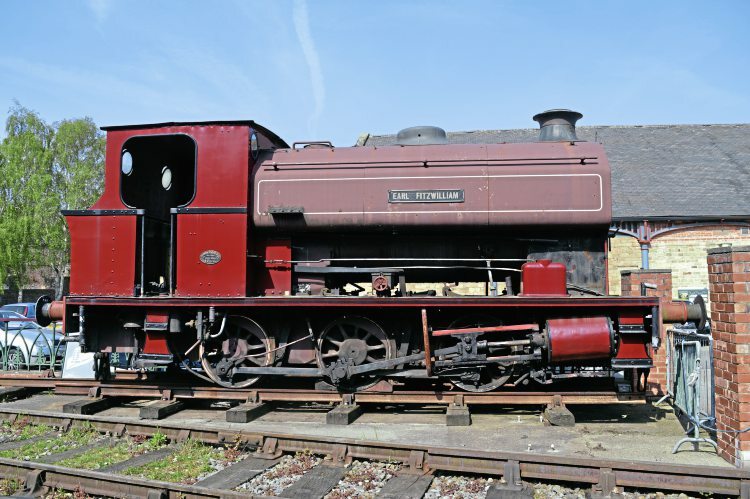 The Avonside 0-6-0ST Earl Fitzwilliam that hauled the revived railway’s first passenger train has been out of service for 15 years and is now on display in the yard at Elsecar. Immediately behind can be seen one of the buildings of the Heritage Centre. The ‘Mardy Monster’ spent its revenue-earning career alongside one of its sister engines at Maerdy colliery in the Rhondda Valley, and remained in use at this site until withdrawn in 1976. After a period of disuse, the ‘Mardy Monster’ was bought with a view to a return to service on the Swanage Railway, but after a further 18 years the engine still remained idle whereupon it was transferred to the Elsecar Heritage Railway in 1997. After a thorough overhaul, the ‘Mardy Monster’ was returned to working order and it started passenger services on June 21, 2003. The locomotive put in 10 years of useful work in this capacity prior to the expiry of its boiler certificate, when it was laid aside for another overhaul, which is currently in progress. One type of locomotive that is very well represented in the EHR collection is Mike Hart’s collection of Sentinel patent high-pressure-geared locomotives produced by the Sentinel Wagon Works in Shrewsbury. In addition to the locomotives produced from totally new components, the frames and wheels (plus other sundry components) of some conventional industrial locomotives were fitted with Sentinel boiler and engine units, with notable examples being the two Manning Wardle specimens: former ‘H’ class Ancoats (Manning, Wardle No. 1091 of 1888) and ‘K’ class 0-6-0ST(No. 848 of 1883) which underwent conversion in 1922 and 1924, respectively. Today, three of these conversions survive in domestic preservation, two of which may be seen on static display at Coalbrookdale in Shropshire. The third survivor, Gervase, was originally built, as with Ancoats, as a Manning, Wardle ‘H’ class locomotive, in this instance No. 1472 of 1900 for Merstham Greystone Lime Co, in Surrey, and its relevant re-useable components were incorporated into Sentinel rebuild WNo. 6807 of 1928 (the conversion was carried out on site by Sentinel fitters). Later in its career, it lost its Manning, Wardle ‘double boss’ wheels in favour of replacements sourced from a scrap Peckett 0-4-0ST during the 1950s. 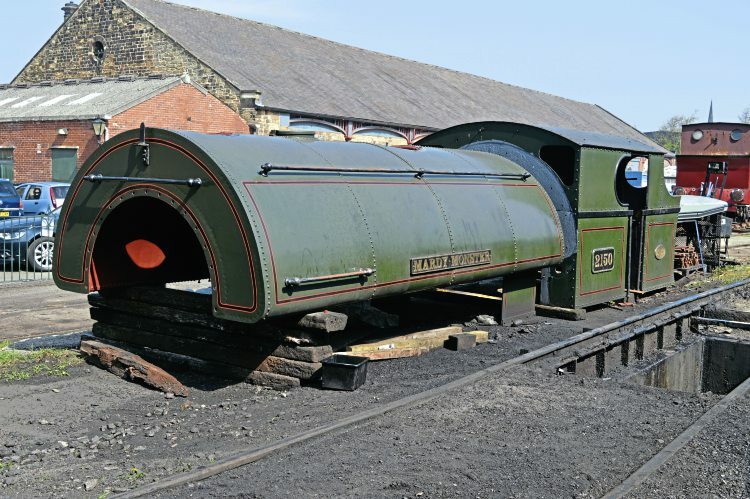 Further evidence of the ‘Mardy Monster’s’ impressive proportions can be gleaned from its cab and saddle tank, which are seen here in the yard at Elsecar. The GWR-pattern numberplate (bearing the locomotive’s works number) is pure fiction from the historical point of view, but it does enhance the engine’s appearance. Initially acquired by the Kent & East Sussex Railway (perhaps rather perversely as the KESR had turned down the prospect of acquiring the intact former Wantage Tramway Company No. 7 in 1962), Gervase saw use on the KESR during its early preservation period, aided by the availability of spare parts from another Sentinel locomotive in the line’s possession at the time, but it fell out of use in more recent years. However, with its move to Elsecar has come restoration to working order, making it the only known Sentinel conversion from a conventional steam locomotive in existence in this condition. One interesting historical point is that the Manning, Wardle Engine Book details for Gervase carry an annotation, almost certainly entered by a Hunslet Engine Co employee, to the effect that its conventional locomotive pattern boiler had been removed and replaced by alternative arrangements. The two remaining Sentinels are both of the more familiar ‘all-new’ pattern. No. 9376 of 1947, a two-speed machine, was built for work in the brewing industry in the form of Ind Coope and Allsop’s premises at Burton-on-Trent. This locomotive went on to have a somewhat chequered career, being sold to Thomas Hill of Rotherham, a concern that had close connections with Sentinel, and which even converted some of the latter’s locomotives to diesel power, in 1960. From here, No. 9376 was sold to the NCB for use at East Ardsley Colliery before being bought again by Thomas Hill three years later. In 1965, the locomotive was sold once again for its last spell of pre-preservation service, this time with General Refractories Ltd, of Deepcar, Sheffield. After six years at the Deepcar factory, a significant part of which was latterly spent out of use, No. 9376 was bought by a member of the Sentinel Trust and initially moved to the Buckinghamshire Railway Centre at Quainton Road (which, it must be remembered, is currently home to a Sentinel railcar repatriated from Egypt). Here, it was once again put into working order before moving to the Rutland Railway Museum, Cottesmore (now ‘Rocks By Rail’) where, despite experiencing some mechanical difficulties, namely a steam leak associated with one of the mudhole doors, lubrication problems, and a loose left hand piston, several demonstration runs were undertaken before the locomotive was relocated once more, this time to Elsecar. It is not planned to restore Sentinel No. 9376 to working order in the foreseeable future and some of its mechanical parts have been cannibalised for the benefit of the line’s other two Sentinel steam locomotives. Nonetheless, in its present partially dismantled condition, it gives the observer the chance to appreciate the distinctive features of this particular type of locomotive as can be seen in the accompanying images. The remaining steam Sentinel at Elsecar is No. 9599 William, which was delivered in 1956 to Courtaulds Fibres Ltd, at Great Coates, near Grimsby, where it was employed hauling the materials necessary for the factory’s normal processes, including the hazardous cargo of caustic soda (sodium hydroxide). William remained in use alongside its classmate George (No. 9596) until dieselisation at the factory in 1978 resulted in the withdrawal from service of both locomotives and their sale during the succeeding decade. 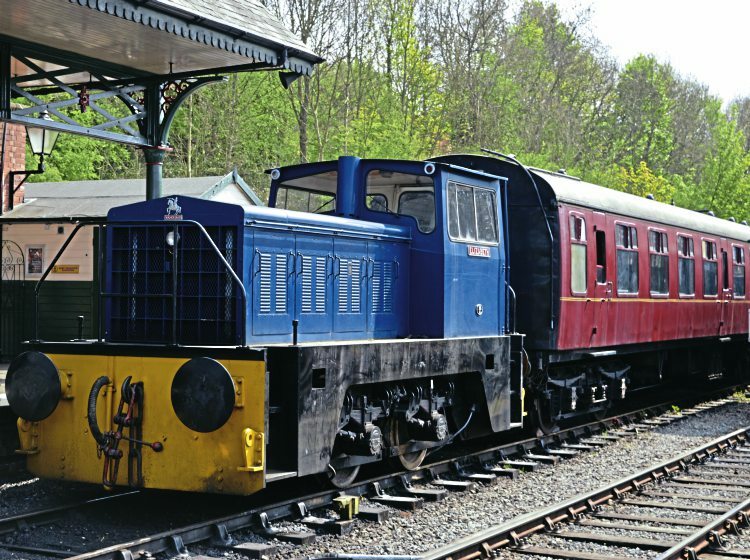 William went initially to Peak Rail at Buxton, where it saw some passenger duties, but proved less popular following Peak Rail’s relocation to Matlock, and it was sold again in 1994, being transferred to the Middleton Railway. William’s spell in Leeds was destined to be a short one as two years later it began a 12-year period on the Battlefield Railway, at Shackerstone, before finally arriving at Elsecar in March 2008. William hauled its first passenger train in South Yorkshire on May 31 of the succeeding year. Currently, the locomotive is undergoing another overhaul, including a 10-year boiler overhaul, and given that a single example of the basic design was constructed for the LMS in 1932 and William was originally named after Sir William Stanier, a director of Courtaulds who presided over the naming ceremony on June 27 1956, the temptation could not be resisted to remove the tapered upper portion of the bonnet and apply the livery of the main line company (a classic application of the ‘celebrity lookalike’ principle). There is, unfortunately, one minor criticism: the number chosen, 7165, was actually carried by one of the Fowler 2F ‘Dock Tanks’; surely No. 7185 would have been more appropriate as this would sit neatly alongside the 7184 carried by the 1932-built Sentinel locomotive. In addition to the steam locomotives currently to be found on the EHR, there is a representative selection of diesel units. Elizabeth is a recent arrival at Elsecar, having been bought from the Middleton Railway in 2015. This loco is a diesel-hydraulic conversion, from an unidentified Sentinel steam locomotive in 1965, by the aforementioned Thomas Hill (No. 138C), which spent its normal service days at Wakefield power station until withdrawn in 1981.
pre-preservation career working in the oil industry, initially at Hamble, subsequently on the Isle of Grain, and finally at Coryton in Essex. Converted from a Sentinel-geared steam locomotive to a 189hp diesel-hydraulic in 1965 by Thomas Hill, Elizabeth poses at Elsecar with the two-coach train of BR Mk.1 coaches. This engine was restored to its original BP livery and ran in this condition at Elsecar following an overhaul during the winter of 2005/6, but it is currently out of service undergoing repairs to its transmission components. The passenger rolling stock currently in use on the EHR consists of four BR Mk.1 coaches, while there are several other items of rolling stock, including such diverse items as a Smith & Rodley diesel crane (another Yorkshire product, emanating from Leeds) and a ‘homemade’ diesel dumper truck of uncertain parentage. At present, with no working resident steam locomotives of its own, the EHR is reliant for its operational steam power on a hired locomotive – Robert Stephenson & Hawthorns ‘standard 14 inch’ 0-4-0ST No. 7386 of 1948 Birkenhead, which formerly worked at Acton Lane power station in London, and is normally based at the Southall Railway Centre. This locomotive was instrumental in enabling the railway to officially celebrate the 20th anniversary of the first passenger working on March 26, 2016. At present it is not possible for passengers to alight anywhere on the line apart from the main terminus at Elsecar, and the lack of a passing loop at the Hemingfield end means that unless top-and-tail working is adopted, a train has to be propelled on its return to Elsecar. This will all change when the extension to Cortonwood is completed as a second fully functional station will be built there to serve the retail complex that has replaced the colliery buildings that once stood on the site. Work on the extension is currently proceeding as time and resources will allow, but currently the Tingle Bridge Lane to Smithy Lane section is all on concrete sleepers and partly-ballasted. Smithey Lane Crossing is awaiting council approval for relaying, and Smithy Lane to Cortonwood has wooden sleepers (the rotten examples of which are being replaced) laid on an ash bed. Concrete sleepers have been obtained from Network Rail, having been rendered surplus to requirements by renewal of track between Barnsley and Chapeltown. Some of the work on the extension has been undertaken by junior soldiers from Harrogate’s Army Foundation College, who were visited undertaking the task during April 2016 by railway patron and Barnsley East MP Michael Dugher. The current limit of working is Hemingfield (Tingle Bridge Lane), but the course of the extension to Cortonwood, in the distance, has been prepared and track panels laid, although much work still remains to be undertaken before the new stretch of track is ready to receive passenger trains. The tracklaying is scheduled to be completed by summer 2017, but the level crossings will require the approval of Barnsley Metropolitan Borough Council and the Office of Rail Regulation before the extension can be fully operational. 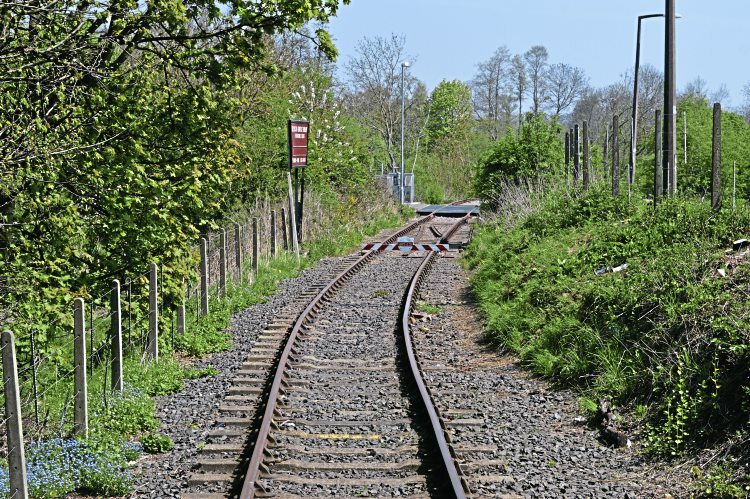 At Hemingfield there are long- term plans for a halt station with a passing loop to connect to a new visitor attraction now in the development stage at Hemingfield Colliery. At present, the Elsecar Heritage Railway is open three days a week from Easter to October, and remains open on selected days throughout the winter, unlike many other preserved railways. 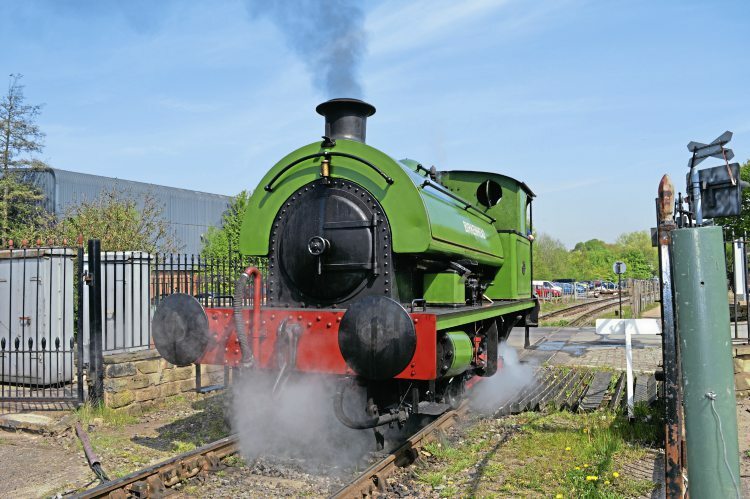 The Elsecar Heritage Railway therefore makes an important contribution to the Barnsley area’s industrial heritage and is set for an even more promising future once the extension is fully operational in the not-too-distant future. Read more News and Features in Issue 237 of HR – on sale now!